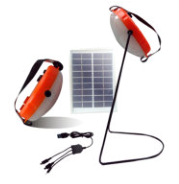 eStore RENEWABLE ENERGY PRODUCTS SOLAR POWER - PORTABLE SOLAR LED LAMP Product designation: B-PSL-0.4W Description: This solar-powered portable LED lamp is flexible mobile lamp which can be use for living, traveling, reading, writing and camping and in emergency case where light is needed. You can easily carry it in your back and suitcase. Advantages: No electrcity bill and no electric skill needed Power: 0.4 W Luminous flux: 50 lm Lifetime: > 43 years @ 4h/day Beam angle: 120˚ x 3 Color Temperature: 6500 K Weight: 126 g Size: Ø100 x H335 mm Portable: Yes Lighting Time: 5-7 h Lighting Mode: Constantly ChargeTime: 3-4 h by USB, 10-12 h by solar panel Power Supply: 5V, 0.4W - 3.7V, 0.6Ah) Available Color: White, grey Warranty: 1 Year Certification: ITEM PRICE contact sales@bouendeu-cleantech.com SOLAR POWER - SOLAR HOME LED LIGHTING SYSTEM Product designation: B-SHLS-2.5W-1 Description: This solar home LED lighting kit is composed of solar panel with 5 m cable, 1 LED-bulb with button or pull switch. 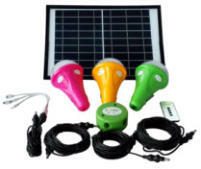 It’s widely used in home lighting and where electricity is hard to reach or to obtain like in disaster areas. 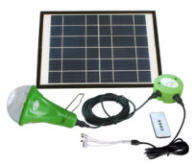 It provides free light from the sun and is maintenance-free. Advantages: No electrcity bill and no electric skill needed Power: 2.5 W Luminous flux: 200 lm Number of Bulbs: 1 Lifetime: > 22 years @ 6h/day Beam angle: 360˚ Color Temperature: 6500 K Weight: 600 g Size: Ø110-H180 - L150xW150 mm Mobile Phone Charger: No Lighting Time: 5-30 h Dimmable: Yes, 25%, 50%, 100% ChargeTime: 4-5 h Power Supply: 5V, 2.5W - 3.7V, 2.6Ah) Available Color: Green, red, organge, yellow, pink Warranty: 1 Year Certification: ITEM PRICE contact sales@bouendeu-cleantech.com SOLAR POWER - SOLAR HOME LED LIGHTING SYSTEM Product designation: B-SHLS-2.5W-3 Description: This solar home LED lighting kit is composed of solar panel with 5 m cable, 3 LED-bulbs with button or pull switch and remote control. 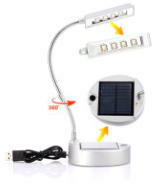 It is the right ecolighting solution for your camping house and place with no power grid. 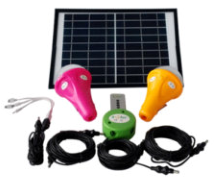 It can replace kerosene or candle lights for rurale home lighting and be applied anywere electricity is hard to reach or to obtain like in disaster areas and during power outage and charge your mobile phone. Advantages: No electrcity bill and no electric skill needed Power: 2.5 W Luminous flux: 200 lm Number of Bulbs: 3 Lifetime: > 22 years @ 6h/day Beam angle: 360˚ Color Temperature: 6500 K Weight: 1.6 kg Size: Ø110-H180 - L308xW185 mm Mobile Phone Charger: No Lighting Time: 5-30 h Dimmable: Yes, 25%, 50%, 100% ChargeTime: 4-5 h Power Supply: 5V, 7.5W - 3.7V, 2.6Ah) Available Color: Green, red, organge, yellow, pink Warranty: 1 Year Certification: ITEM PRICE contact sales@bouendeu-cleantech.com .